power will begin to wane and the days grow shorter. The sun has touched the northernmost point along the horizon and is about to embark upon the long journey back south, ending at the Winter Solstice in December. The summer solstice was an event of tremendous importance to the early inhabitants of the British Isles and Ireland, who built a number of magnificent megaliths aligned to the sunrise on this day. In southwest England, an unbroken thread of tradition connects the 5,000-year-old temple of Stonehenge with ritual activities through the Bronze Age, the Iron Age, and into modern times. 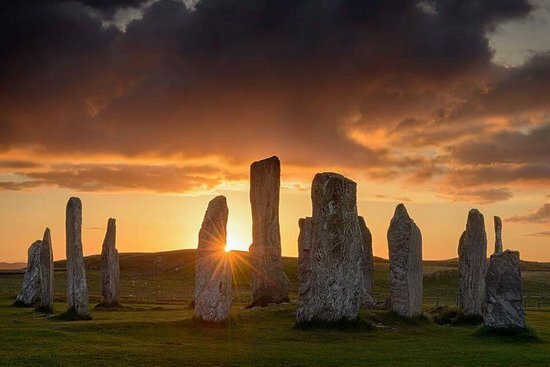 Another great stone temple to the Summer Solstice is at Callanish on the island of Lewis, in the Outer Hebrides. Here, four rows of stones lead into a circle from the four directions, forming a Celtic cross in the landscape, and the stones form an astronomical observatory aligned to the solstice sunrises and sunsets, as well as to the equinoxes. Callanish is so far north, the sky never actually darkens on a midsummer night. This is also the case at the mysteriously beautiful stone circle, the Ring of Brodgar, on Orkney, which was known for centuries by local people as the Temple of the Sun, aligned as it is to the midsummer sunrise. Up until recently, this moment of the triumph of the light, and yet also the beginning of its decline, was celebrated with great bonfires when the whole community gathered once again on the hilltops to celebrate life through feasting, dance, ritual and song, to rejoice in the sun at the height of its power – and perhaps also to pray that it not die too soon. In later years, these celebrations usually took place the night of June 23rd, which was called St. John’s Eve, as the Christian Church dedicated the ancient pagan festival to Saint John the Baptist, the prophet born six months before Jesus Christ. For Summer Solstice was one of the three Spirit Nights of the year, the other two being Beltaine and Samhain. Faeries and the spirits of the dead were abroad, easily visible to those whose sensitivities made the veil between the worlds appear exceptionally thin. This was an especially good time to cull magical and healing herbs: fern seed gathered on midsummer’s eve could make one invisible; elderberries warded off enchantment; stonecrop, vervain, and yarrow were hung in special places around the house for protection against the evil eye and death. Above all, this was the time for plucking St. John’s wort, the golden, star-shaped flower that was first of all herbs to be gathered on St. John's Eve. Called the ‘blessed plant’ in Wales, it was renowned throughout the Celtic lands for bringing peace and prosperity to the house, health to the animals and a bountiful harvest. It was cast into the midsummer bonfires in Scotland, and placed over the doors of houses and farm buildings for its protective powers. We never have SJW or vervain up by the Solstice, so I've kind of rearranged all of this to suit the place I live in. I do however sit under hawthorns and elders every Solstice eve. And gather what is ready. Most of our harvest falls between now and Lammas, so I think it's important to adapt. I am not sure where to find it here as well... I didn't gather any herbs, but I did gather yellow flowers and some other things for my altar... it turned out really beautiful. We all gathered small quantites of herbs from our friends' herb-garden, to dry and make into amulets for the year. Having had Pimms in the garden at mid-day, we decided that it was a bit hot for sitting outside, and went in to chat until the astronomical solstice, which we toasted outside with a specially brewed plum concoction that comes out sun-coloured. Predictably, by then the sun was hidden in clouds. If we were on our own we'd have gone up into the woods, to our glade, but our friends live in a relentlessly urban environment and aren't as mobile as they once were, so I agree with fera'; it's important to adapt for any number of reasons. Very low-key Solstice celebration here, since my wife was dealing with health issues and I was in the middle of a gimondo panic attack. But we did some divination and set some intentions for the coming part of the cycle, and then we ate pseudo-s'mores, and all was well. Summer Solstice Blessings for 2018 ! Its rainy and dark here but, everything is green and loving the watering. Solstice greetings to you all. Midsummer this year was a bit of a non-event...charming and sunny but I have too much on my mind(Danny) and too much work (always) so it passed fairly uneventfully. This coming Lammas marks one year I've been in my new home, the Nemeton, so I plan some more overt festivity and ritual. Midsummer is usually tied with Yule for my favorite festival, but it was low key this year. Still getting used to the very different environment here, and that's ok.